For almost a year researchers at the University of Alberta worked to solve a riddle. What caused lake ice to shatter so violently on New Year's Day that homes in three central Alberta beach communities were damaged? Researchers at the University of Alberta worked for almost a year to solve a riddle. What caused lake ice to shatter so violently on New Year's Day that it damaged homes in three central Alberta beach communities? On Jan. 1, 2018, residents of Alberta Beach on Lac Ste. Anne, northwest of Edmonton, awoke to a loud bang, the ground shaking and cracks forming in their homes and in the ground. Similar quakes, with a magnitude of 2.0 on the Richter scale, occurred at Pigeon Lake and Gull Lake. At the time, researchers knew the tremors were caused by fracturing of the lake ice, but didn't know what caused the ice to shatter so violently. Ice quakes — or cryoseisms — are normally caused by a sudden drop in temperatures as a cold snap causes water in the ground to freeze and expand. The ice has nowhere to go, so as pressure mounts it eventually cracks the soil, causing the earth to shake. Temperatures on New Year's Day were warming rapidly, rising by 30 degrees over 24 hours. "The mystery there is, why would it warm, expand and then crack?" Kavanaugh asked at the time. Solving the mystery would involve expertise in several fields, bringing together Kavanaugh, physicist Mirko van der Baan, Ryan Schultz, a geophysical research scientist and seismologist at the Alberta Geological Survey, and other geoscientists. The work paid off. On Tuesday, Schultz said they have found the answer. As New Year's Day dawned, a series of unlikely weather conditions came together, he said. A lack of insulating snow cover, high water levels and a dramatic rise in temperature over 24 hours — from -35 C to -5 C — caused lake ice to rapidly warm. "Ice is a tricky thing," Schultz told CBC's Radioactive Thursday. "It expands under two conditions, when you take water and turn it into ice — that's when it expands because of what's called a phase change — but it also expands like a normal solid when you heat it up. "Think of putting an ice cube in a glass of water where you suddenly get that crack of the ice itself, so that would be like an ice quake." 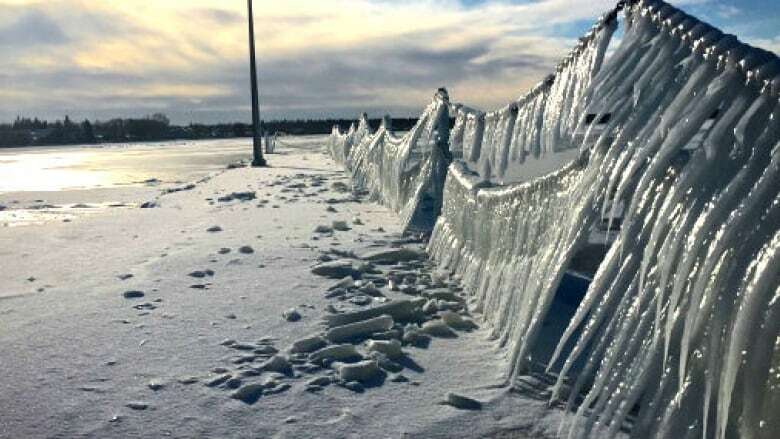 "This caused a rapid thermal expansion of the ice, up to four metres toward the shoreline," Schultz said. "With nowhere for the expanding ice front to go, it eventually buckled and broke suddenly — resulting in the ice quake shaking and the spectacular ice ridges forming near the lakefront." Ice quakes of such magnitude are especially rare, van der Baan said. "Lake ice ruptured nearly instantaneously over hundreds of metres, which is very unusual," he said. "The last time this happened on the Albertan lakes was probably several decades ago."